The Widow’s Uniform | The British in Crete, 1896 to 1913. In 1897 the British army adopted khaki as the colour for the uniforms of its troops serving overseas; a move that had to wait until 1902 for home based troops. However, It’s unclear from the contemporary accounts whether the first two battalions to arrive on Crete in 1897, the 1/Seaforth Highlanders and the 2/Royal Welsh Fusiliers, had actually changed into khaki before reaching the island. Assuming they had changed, the photograph below, taken in Malta and published in 1898 in the Navy and Army Illustrated, shows the standard kit for the ‘other ranks’: for the Welsh at least. However, at least one illustration in the Illustrated London News in 1897 indicates, in the artist’s colouring notes, that at least some of the British Officers in Crete wore red uniforms. 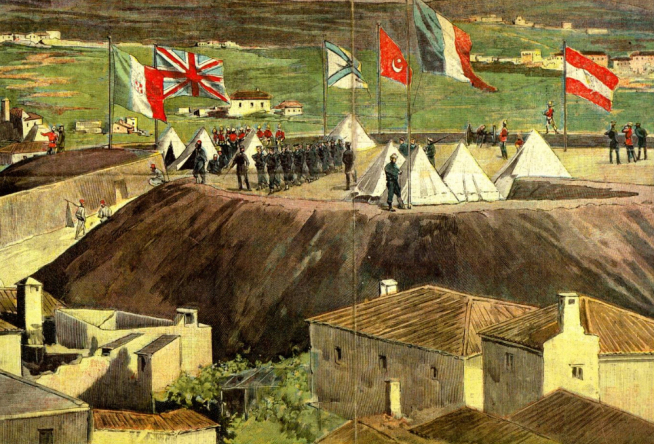 Additionally, the coloured engraving below showing the troops of the Powers occupying the bastion in Canea, source and date unknown but before early 1898 when the Austro-Hungarians withdrew, appears to show some British troops still in red. 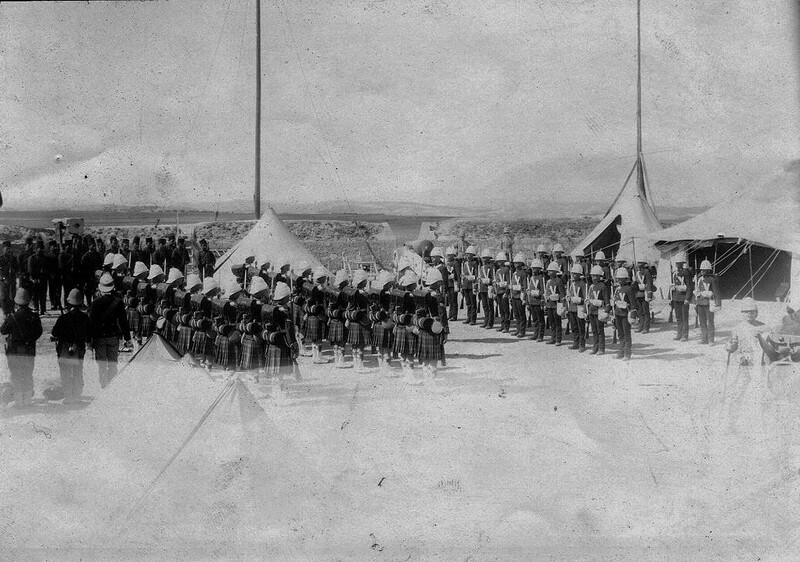 Similarly, the photograph below, taken in 1897 and showing the Seaforths and Welsh Fusiliers changing the guard in Candia, appears to show both bodies of troops in red uniforms: compare with the khaki worn by the figure in the bottom right of the photograph. Additionally, the illustration of the of the Seaforths firing the salute appears to show them in their dress, red, uniforms, rather than in Khaki. When out in the field, as in the illustration below of a Seaforths patrol going out to deter Christian Cretans from interfering with the water supply to Candia in 1897, they apparently wore khaki. Crete 1897. 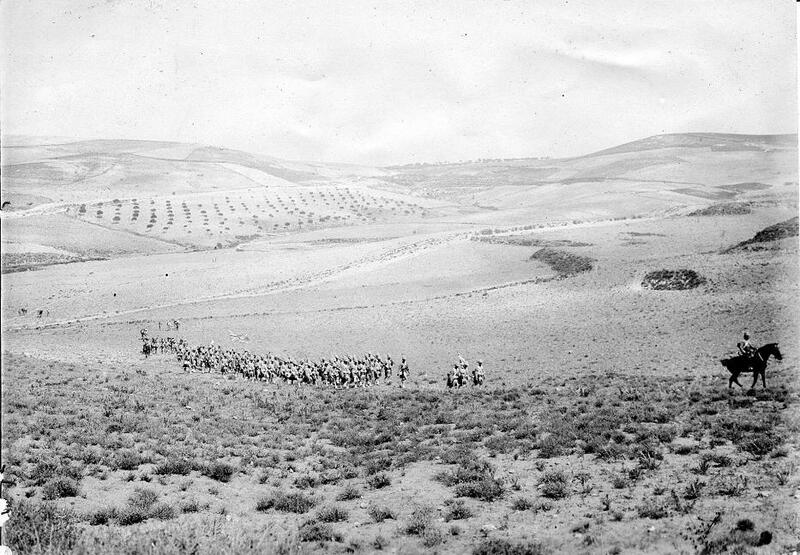 Seaforth Highlanders on patrol near Candia. 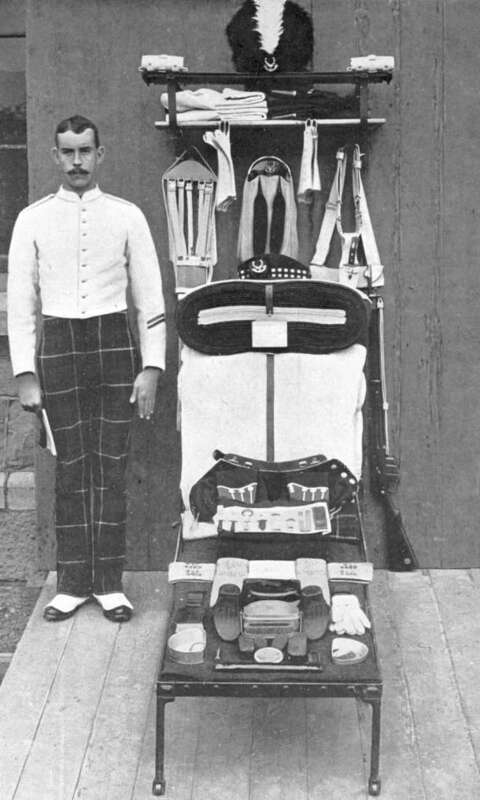 While khaki was an improvement on the previous red uniforms (excepting of course for the Rifle Brigade and King’s Royal Rifles who were in green), the Scots still had to wear their kilts, both at home and abroad, as above photographs, and the one below of a Seaforth Highlander at kit inspection c. 1897, clearly show. Seaforth Highlander’s kit. c.1897 Source: Navy and Army Illustrated. This entry was posted in British Army in Crete, European Intervention Crete, Royal Welsh Fusiliers, Seaforth Highlanders and tagged British army uniforms 1897, Crete 1897, European Intervention Crete, Royal Welsh Fusiliers, Seaforth Highlanders on January 23, 2016 by Mick McT.